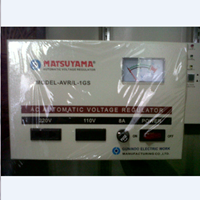 Stabilizer (Stavolt) Matsuyama AVRLD5GSThe important function of the stabilizer is to make the output voltage that feeds the equipment connected to as much as possible equivalent to the ideal electrical power supply, ensuring that the oscillation of the electric power is offset, and its output maintains a stable value, preventing them from being experienced by the equipment and thus avoiding damage .Matsuyama's motor servo motor stabilizer system can stabilize the inlet voltage and change the up and down loads to keep the output voltage stable.Equipped with a series of "Audio Wind Back System" that can overcome the start kesulitas after experiencing power outage with a sensitivity of about 2% of the input.Power consumption is small, high efficiency level.Minimum expenditure, results maximized.Advantages and advantages:- Microwive, oven, washing machine, sound system and refrigerator can operate manually.- Efficiency of industrial machine work is maintained so that the quality of production can be fulfilled.- Central electric telekomonikasi not disturbed so that the communication becomes smooth.- After sales service is guaranteed, machine parts are always available.- Air conditioning (AC) works well, AC compressor is not noisy and not flammable.- Machines with high sensitivity to changes in utility voltage can still run well.- The computer works normally so that the office activities can run well.- TV picture is perfect. 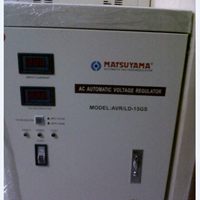 Stabilizer (Stavolt) Matsuyama AVRLD15GSThe stabilizer function is to keep the electric current voltage stable (normal), a stable current is needed for various electronic equipment. 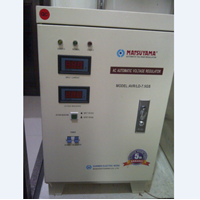 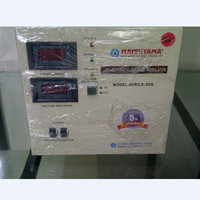 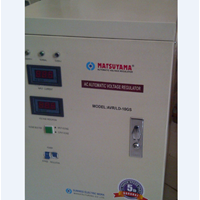 Such as food cooler or refrigerator, Air Conditioner, Computer, and other electronic items.Matsuyama's motor servo motor stabilizer system can stabilize the inlet voltage and change the up and down loads to keep the output voltage stable.Equipped with a series of "Audio Wind Back System" that can overcome the start kesulitas after experiencing power outage with a sensitivity of about 2% of the input.Power consumption is small, high efficiency level.Minimum expenditure, results maximized.Advantages and advantages:- Microwive, oven, washing machine, sound system and refrigerator can operate manually.- Efficiency of industrial machine work is maintained so that the quality of production can be fulfilled.- Central electric telekomonikasi not disturbed so that the communication becomes smooth.- After sales service is guaranteed, machine parts are always available.- Air conditioning (AC) works well, AC compressor is not noisy and not flammable.- Machines with high sensitivity to changes in utility voltage can still run well.- The computer works normally so that the office activities can run well.- TV picture is perfect. 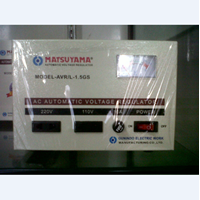 Buat Permintaan Untuk "1 Phase"
Stabilizer (Stavolt) Matsuyama AVRLD2GSThe important function of the stabilizer is to make the output voltage that feeds the equipment connected to as much as possible equivalent to the ideal electrical power supply, ensuring that the oscillation of the electric power is offset, and its output maintains a stable value, preventing them from being experienced by the equipment and thus avoiding damage .Matsuyama's motor servo motor stabilizer system can stabilize the inlet voltage and change the up and down loads to keep the output voltage stable.Equipped with a series of "Audio Wind Back System" that can overcome the start kesulitas after experiencing power outage with a sensitivity of about 2% of the input.Power consumption is small, high efficiency level.Minimum expenditure, results maximized.Advantages and advantages:- Microwive, oven, washing machine, sound system and refrigerator can operate manually.- Efficiency of industrial machine work is maintained so that the quality of production can be fulfilled.- Central electric telekomonikasi not disturbed so that the communication becomes smooth.- After sales service is guaranteed, machine parts are always available.- Air conditioning (AC) works well, AC compressor is not noisy and not flammable.- Machines with high sensitivity to changes in utility voltage can still run well.- The computer works normally so that the office activities can run well.- TV picture is perfect. 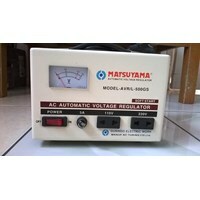 Stabilizer (Stavolt) Matsuyama AVRLD10GSThe important function of the stabilizer is to make the output voltage that feeds the equipment connected to as much as possible equivalent to the ideal electrical power supply, ensuring that the oscillation of the electric power is offset, and its output maintains a stable value, preventing them from being experienced by the equipment and thus avoiding damage .Matsuyama's motor servo motor stabilizer system can stabilize the inlet voltage and change the up and down loads to keep the output voltage stable.Equipped with a series of "Audio Wind Back System" that can overcome the start kesulitas after experiencing power outage with a sensitivity of about 2% of the input.Power consumption is small, high efficiency level.Minimum expenditure, results maximized.Advantages and advantages:- Microwive, oven, washing machine, sound system and refrigerator can operate manually.- Efficiency of industrial machine work is maintained so that the quality of production can be fulfilled.- Central electric telekomonikasi not disturbed so that the communication becomes smooth.- After sales service is guaranteed, machine parts are always available.- Air conditioning (AC) works well, AC compressor is not noisy and not flammable.- Machines with high sensitivity to changes in utility voltage can still run well.- The computer works normally so that the office activities can run well.- TV picture is perfect. 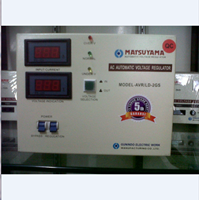 Stabilizer (Stavolt) Matsuyama AVRLD3GSThe important function of the stabilizer is to make the output voltage that feeds the equipment connected to as much as possible equivalent to the ideal electrical power supply, ensuring that the oscillation of the electric power is offset, and its output maintains a stable value, preventing them from being experienced by the equipment and thus avoiding damage .Matsuyama's motor servo motor stabilizer system can stabilize the inlet voltage and change the up and down loads to keep the output voltage stable.Equipped with a series of "Audio Wind Back System" that can overcome the start kesulitas after experiencing power outage with a sensitivity of about 2% of the input.Power consumption is small, high efficiency level.Minimum expenditure, results maximized.Advantages and advantages:- Microwive, oven, washing machine, sound system and refrigerator can operate manually.- Efficiency of industrial machine work is maintained so that the quality of production can be fulfilled.- Central electric telekomonikasi not disturbed so that the communication becomes smooth.- After sales service is guaranteed, machine parts are always available.- Air conditioning (AC) works well, AC compressor is not noisy and not flammable.- Machines with high sensitivity to changes in utility voltage can still run well.- The computer works normally so that the office activities can run well.- TV picture is perfect. 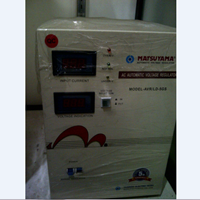 Stabilizer (Stavolt) Matsuyama AVRLD7.5GSThe main function of the stabilizer is to make the output voltage that feeds the equipment connected to as much as possible equivalent to the ideal electrical power supply, ensuring that the oscillation of the electric power is offset, and its output maintains a stable value, preventing them from being experienced by the equipment and thus avoiding damage they.Matsuyama's motor servo motor stabilizer system can stabilize the inlet voltage and change the up and down loads to keep the output voltage stable.Equipped with a series of "Audio Wind Back System" that can overcome the start kesulitas after experiencing power outage with a sensitivity of about 2% of the input.Power consumption is small, high efficiency level.Minimum expenditure, results maximized.Advantages and advantages:- Microwive, oven, washing machine, sound system and refrigerator can operate manually.- Efficiency of industrial machine work is maintained so that the quality of production can be fulfilled.- Central electric telekomonikasi not disturbed so that the communication becomes smooth.- After sales service is guaranteed, machine parts are always available.- Air conditioning (AC) works well, AC compressor is not noisy and not flammable.- Machines with high sensitivity to changes in utility voltage can still run well.- The computer works normally so that the office activities can run well.- TV picture is perfect.